Answer: Take a look at this photo I shot just after sunset in November 2017. The air temperature was dropping rapidly, and these very low clouds formed over the New River Mountains, 10 km northeast of my location and about 1500 meters elevation. 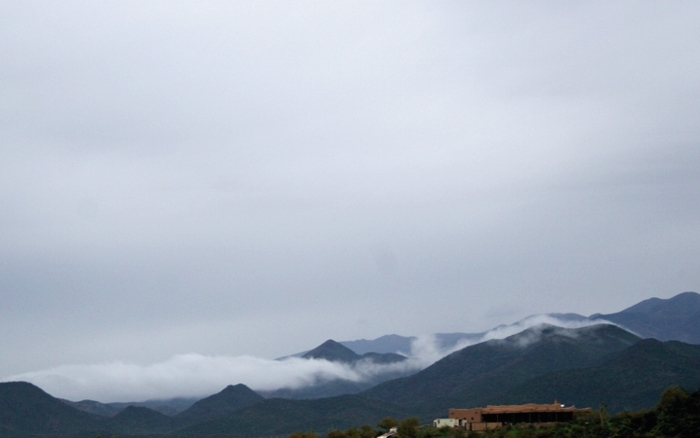 If you were on the summit of that mountain you’d be standing inside a cloud. And that’s exactly what fog is — a cloud at ground level. The graph below is a simplified version of the dew point charts you’ll find online. Some extend to much higher temperatures, but 40 °C (104 °F) is high enough for this explanation. The air in Earth’s atmosphere contains 78% nitrogen (N2), 21% oxygen (O2), 0.9% monatomic argon (Ar), and traces of other gases. The amount of water vapor can vary from almost 0% to around 4%, depending on location and time, but water vapor is always present to some extent — even in the air over deserts. 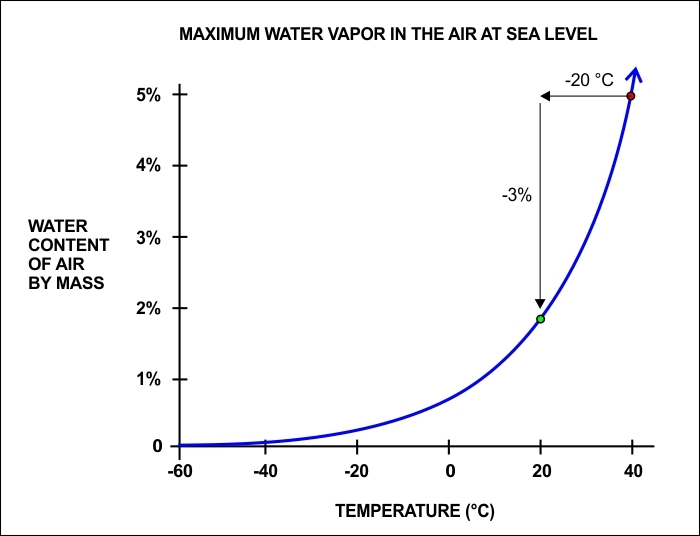 Now here’s the key idea behind that dew point graph: The maximum amount of water vapor air can hold depends on the air temperature. Hotter air can hold more water. At 20 °C the air can hold a maximum of 2% water vapor, so it will lose 3% of its water content in any of several forms: rain, snow, clouds, fog, hoarfrost, or dew (hence the term dew point). In some cases that water “falls” to the ground, but in the case of clouds and fog it remains suspended in the air as micro-droplets (see my June 24, 2013 post: What Clouds Are). At this point the definition of dew point should be clear: The dew point is the temperature to which a mass of air must cool in order give up some of its water vapor in the form of liquid (or frozen) water. And sometimes that water takes the form of fog. FYI, about 90% of the atmosphere’s water comes from evaporation at the surfaces of oceans, lakes, and rivers. The rest is from transpiration by living plants. Because the atmosphere is always in motion, this water vapor gets redistributed around the globe. Obviously, the redistribution is far from uniform.